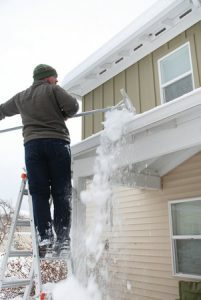 More often than not, an ice dam is likely to blame if your roof is leaking in the wintertime. But there are other things that can cause your roof to leak as well. Before you assume that an ice dam is causing your roof to leak this winter, consider some of the other possibilities. Let’s take a look at a few other reasons that could explain why your roof is leaking. You more than likely have a chimney that comes up through your roof along with a series of vents from various parts of your home. There are very tiny gaps that exist between your chimney and vents and your roof, and if you’re not careful, water could get into those gaps and cause your roof to leak. You can avoid this by checking on the metal flashing that covers the gaps and keeps water out. If flashing is ever missing or deteriorating, you’ll need to have roof repair done to fix the problem and avoid an inevitable leak. Most homes have what are called roof valleys in them. Roof valleys are areas where two planes of your roof intersect. These valleys need to be sealed properly to prevent them from leaking. If they’re not sealed the right way when your roof is first installed or if your seals wear down on you over time, you’ll need to have them resealed to stop your roof from springing a leak. This is obviously just about the worst problem you can have when it comes to your home’s roof. A hole in the roof, no matter how big or small it might be, will allow water to get in every time it rains or snows in the winter. You’ll need to have a hole in your roof patched up immediately to stop the hole from getting larger and allowing more moisture into your house. If your roof starts leaking for any reason this winter, Roofing by Bruce can come out to your home and provide you with roof repair services. Call us at 570-424-8891 today for all your roofing needs.